Ever since we got a fire pit for our backyard last summer, I've eaten more marshmallows than I have since I was about thirteen years old. 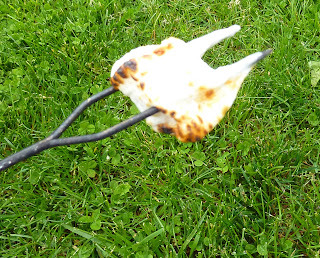 It's not even that I like marshmallows that much—it's just that when you have a fire going, that's what you do. You roast marshmallows. And I must admit, when you get those beautifully golden-brown specimens, it's totally worth it. I do like the taste and texture of a perfectly fire-toasted marshmallow—although I'm not particularly skilled at it myself (see pic below). And who doesn't like s'mores? With Trader Joe's offering, you're not eating a bunch of unpronounceable chemicals. I mean, we've all heard some scary things about carrageenan—and I'm not sure why they slipped something like that in this otherwise "healthy" marshmallow—but I'll take tapioca syrup and cane sugar over corn syrup and dextrose any day of the week. And indeed, they do taste better than traditional marshmallows, too, at least in my humble opinion. Sonia thinks they taste more "sugary" than, say, Kraft marshmallows. I see where she's coming from. Especially raw, it almost feels like you can detect the cane sugar granules as you chew them. The tapioca gives them a very unique mouthfeel as well. Just think of a really tasty bowl of evaporated tapioca with a bunch of cane sugar to add sweetness, then congealed in a marshmallow shape. Sonia and I had some at our little camping excursion this past weekend. (It's still "camping," even if it is in our own backyard...right?) 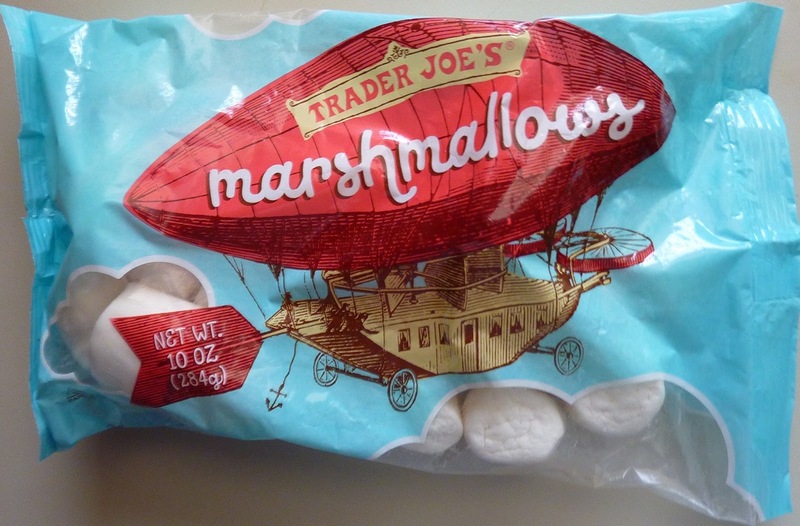 I'd say they taste more like traditional marshmallows after they've been toasted—that is, it would be much harder to distinguish the Trader Joe's marshmallow and the traditional marshmallow in a blind taste-test if both specimens were toasted. I'm pretty sure I could do it if they were both raw. I didn't feel like they puffed up as much as normal marshmallows on the fire. They browned around the edges okay, they got nice and soft, and they had that traditional yummy goo in the center, but they more or less maintained their original dimensions even after heating. Raw, toasted, or in a s'more, these guys deliver. Sonia and I both think that, as marshmallows go, these are among the best we've tried. With a long summer of campfires ahead, we'll undoubtedly buy more in the near future. Four stars a piece. As soon as I saw the questioning of carrageenan, I knew that meant no gelatin! Great for people who don't really want to eat gelatin, since they know where it's been... I avoid regular marshmallows because of the gelatin, but could eat these. I don't eat jello but Hunt's Snack Pack gel desserts are made with carrageenan so I can eat those. Likewise Dole doesn't use gelatin in its gelled fruit cups. But they do use cochineal in the pink or red ones, and I don't eat insect residue.... Ick. I know where that's been, too. Carrageenan is used often enough nowadays that I think some people are just developing allergies to it. The other viewing with alarm seems based on unconvincing limited animal studies to me (I'm a chemist and work with biotech and pharmaceutical documents). I have trouble with the omnipresent chickory root extract (inulin) and its fakey fiber friends probably for the same reason. Too much exposure. I love to snack on frozen marshmellows! They get this amazing chewy texture and don't ever get rock hard frozen. As a vegetarian, I was sad to read this at Trader Joe's website: "We’re selling each ten ounce bag of Trader Joe’s Marshmallows for $2.99—but stock up while you can, because these pillow-y puffs are seasonal and will be gone by summer’s end!" Yes!!! I love frozen marshmallows!!! Or fresh from the microwave. I've never had a roasted one though! My girlfriend keeps somewhat kosher and has always been sorely disappointed by kosher marshmallow offerings. After surprising her with these last night, she proclaimed they were far and away the best she'd tried. Nice work on this one, TJ's! These sound/look great, and I'm sure they're not as expensive as the vegan Dandi marshmallows I'd normally buy. How much were these going for? I'm pretty sure they were $2.99, which is apparently much less expensive than other vegan marshmallows. YAY!!!! As a vegetarian who hasn't had s'mores or Rice Krispy treats in a looooong time, I'm really excited to try this product. I'll definitely have to look for them at my store. I agree. These are abnormally good marshmallows. I like the sugar-feel they produce on the tongue when you eat them. It has a better texture and doesn't have the chemical taste of the normal commercial brands. We paired the honey graham crackers, our favorite chocolate, and the marshmallows for some really great s'mores (toasted in the toaster oven, not over a backyard fire).